appear pretty soon--and believe that they will. In answer to your queries, mother, I received the quarterly, the interesting article from the Register, and my room is fine. I got to stay in the best part of the BOQ contrary to my original expectations. I also heard from Mr. McCown. 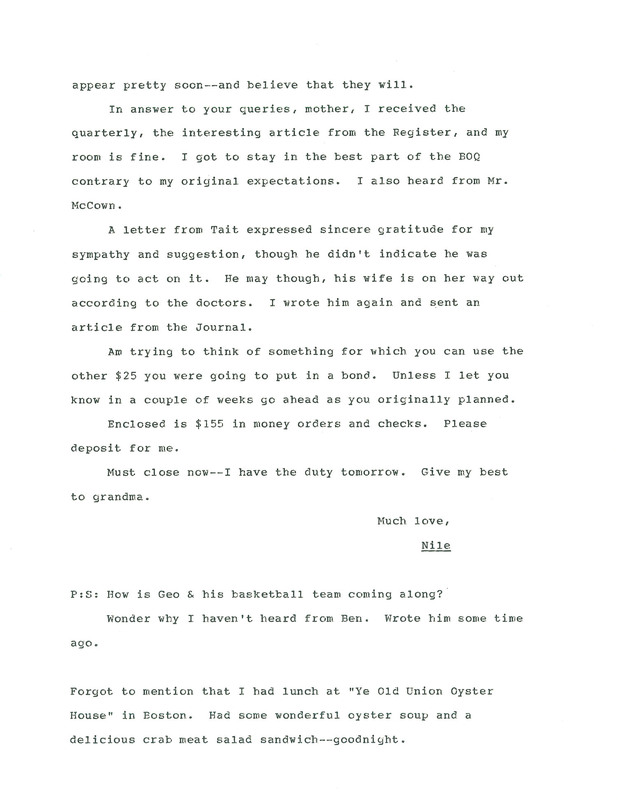 A letter from Tait expressed sincere gratitude for my sympathy and suggestion, though he didn't indicate he was going to act on it. He may though, his wife is on her way out according to the doctors. I wrote him again and sent an article from the Journal. Am trying to think of something for which you can use the other $25 you were going to put in a bond. Unless I let you know in a couple of weeks go ahead as you originally planned. Enclosed is $155 in money orders and checks. Please deposit for me. Must close now--I have the duty tomorrow. Give my best to grandma. Much love, Nile P:S: How is Geo & his basketball team coming along? Wonder why I haven't heard from Ben. Wrote him some time ago. Forgot to mention that I had lunch at "Ye Old Union Oyster House" in Boston. Had some wonderful oyster soup and a delicious crab meat salad sandwich--goodnight.